Kilbroney, Falls, Belvoir, Belfast, Downpatrick, Lisbon and the parks – check over the jump for more craic! Another massive week for the club – can someone check the water at the Dub, it might explain the form from literally everyone in the club. It is amazing to see and a privilege to write about – soon. Did you know, A recent scientific study showed that out of 2,293,618,367 people, 94% are too lazy to actually read that number.. So, our run of PBs continues! Well done Paul – that is some running over that course, we all hope that this week you took the head torch off before getting your photo taken at the finish line below! You’re making these night-time events your own this year, and you smashed your time on last year’s course by 7 minutes. Normally we’d tell you to relax and enjoy the rest of the weekend, but we know that that didn’t happen! 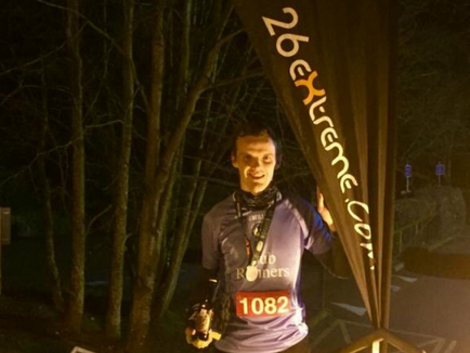 Night Vision: Paul completes another night time race! 1 Steven Todd 00:19:15 1st Place! 2 Niall McCrory 00:20:50 2nd Place! 6 Marie Sweet 00:23:56 1st Place! Newbie PB! 7 Paul McFlynn 00:23:58 Newbie PB! 9 Karen Carlisle 00:24:46 2nd Place! New PB! 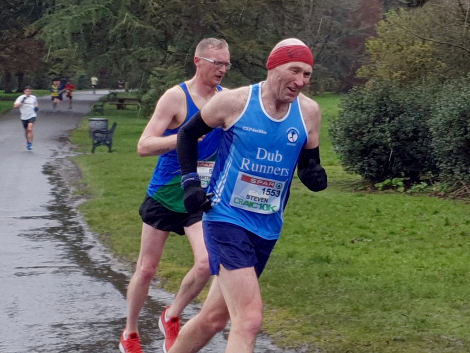 11 Ronan McCaughey 00:24:51 Newbie PB! 12 Maire McCaughey 00:24:57 3rd Place! Newbie PB! Flashmob: Our newly formed Dub Swimming Club at Falls on Saturday! Belvoir: Maureen and that bloody rollercoaster again! Belvoir: Paul makes it look easy! 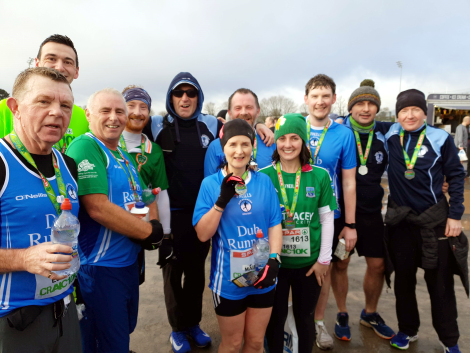 In amongst the sea of green on Sunday morning was our very own wave of blue. 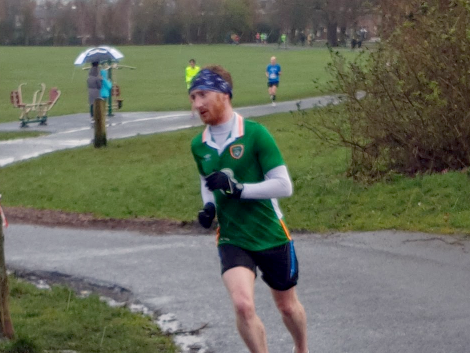 This increasingly popular St. Patrick’s Day race led 1,700 runners from city hall to Ormeau Park (via the Falls road). 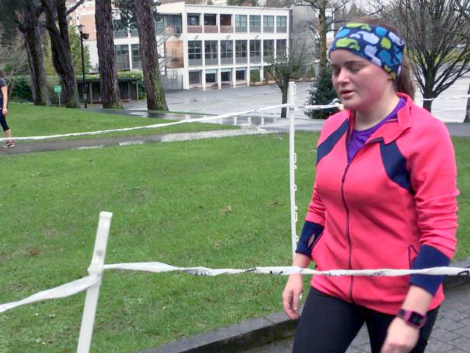 A course that was testing enough – but throw in some freezing rain and we got a ceili. Who was dancing in the rain? 39 Jim Larkin 00:38:47 New PB! 48 Niall McCrory 00:38:49 New PB! 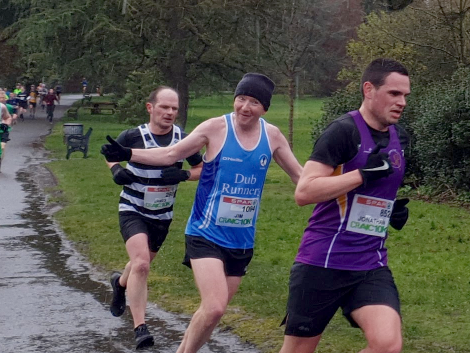 282 Ronan McCaughey 00:48:07 New PB! 300 Maire McCaughey 00:48:37 New PB! 310 Liam Lavery 00:48:48 New PB! We are a waterproof club – another outstanding and fantastic team performance from everyone! 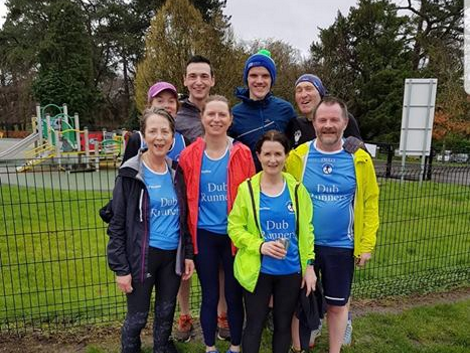 The race begins much earlier than anyone really should be up on a Sunday or holiday morning – but out blue top duly delivered with stunning new 10k PBs from Jim, Niall, Ronan Mc, Maire Mc and Liam – topping off a wet and miserable day. Lots to be celebrated later – the photos don’t do the weather justice – sláinte! Some Craic: Steven leads the Dubs home! Some Craic: Jimbo has time to pose on his way to a smashing PB! Some Craic: Niall focused on the goal - PB! Some Craic: Noel gets a final burst to the finish! Some Craic: James powers his way to the line! Some Craic: Happy Dubs. Lots of PBs. Time to celebrate! 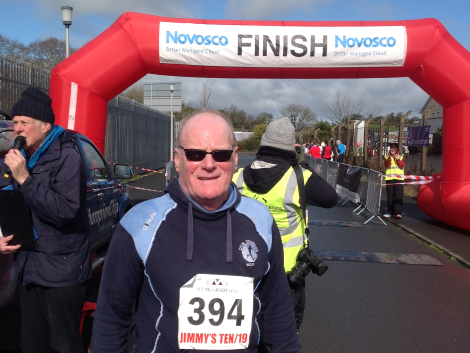 Donepatrick: Another Jimmy's 10k completed for Alex! Ah sure don’t we all love to get away? Well set a course for Portgual – at warp speed if possible! 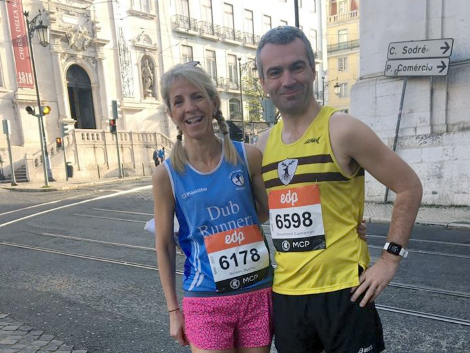 A scenic costal route, trending downhill for the first 5k – then the natural roll of the coast line around the heart of Lisbon. 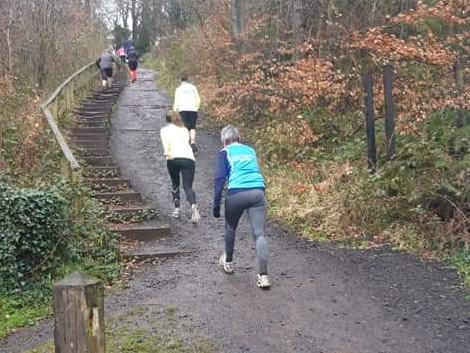 A cracking route in a lovely locale – who was the mysterious Dub taking part? 1400 Roisin Byrne 01:37:54 New PB! 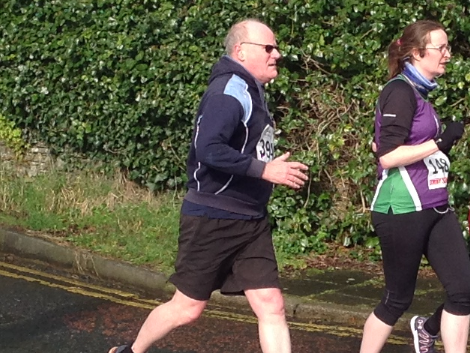 Lisdone: Roisin smahes her PB with Ray from that other club! Catherine BAILLIE 00:23:15 2nd Place! Bernadette O'KANE 00:22:00 3rd Place! Richard CONN 00:18:03 1st Place! Dale BIGGERSTAFF 00:36:50 New PB! Julia ORR 00:26:58 1st Place! Newbie PB! Mike SMITH 00:26:15 Newbie PB! 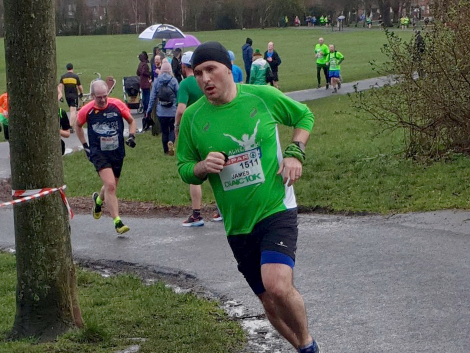 Great running everyone – I think everyone either ran alternative routes or through massive puddles to complete their runs! Grab a hat, and tip it to our Dubs who took the top step of the podium was Richard (at Enniskillen) and Julia (at Stranmillis College). On the second step was Catherine (at Ecos) and grabbing the final spot was Bernie (at Portrush). Just the one new awesome PB this week set by Dale (at Ormeau). 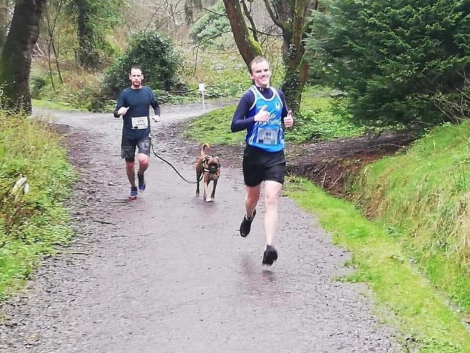 Finally, we’d some tourists setting newbie PBs including Stranmillis College’s very own event director Julia (at Stranmillis College) and Mike (at Eastbourne) continuing his run of tourism and never repeating a single event! 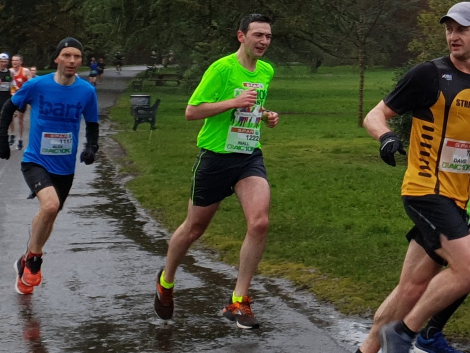 parklife: Stranmillis College's event director finishes the course for the first time! Time to relax now. Once again, another edition of the roundup that just wouldn’t have been out in time if it wasn’t for the loads of little birdies who helped put it together. There was so many of you all this week – I don’t want to name names in case I insult someone by leaving them out – top job, thank you. Speaking of, people try to send me jokes, in the hope of getting included here, but I have to tell you, some puns make me feel numb – but maths puns make me feel number.